Welcome to our complete library of Studio Diary themes. You’ll find in-depth descriptions of each Diary when you click on the individual product. You are welcome to purchase any single Studio Diary below for just $36, or purchase a complete Year of Studio Diaries for $345. Once you purchase a Diary, it’s yours to keep and enjoy for life! To access your purchased Diaries, enter your username and unique password into the Login Area at the top of this website and select ‘My Account’ from the drop-down menu. If you have any questions, please email us at: teamlove@florabowley.com. In this Diary, I’m excited to share a wide range of ideas and exercises to support a more personal and meaningful art making experience. This potent topic is all about using the richness of your life and your unique experiences as fuel to fan the flames of your creative expression. This Diary is all about Creative Business with Heart. 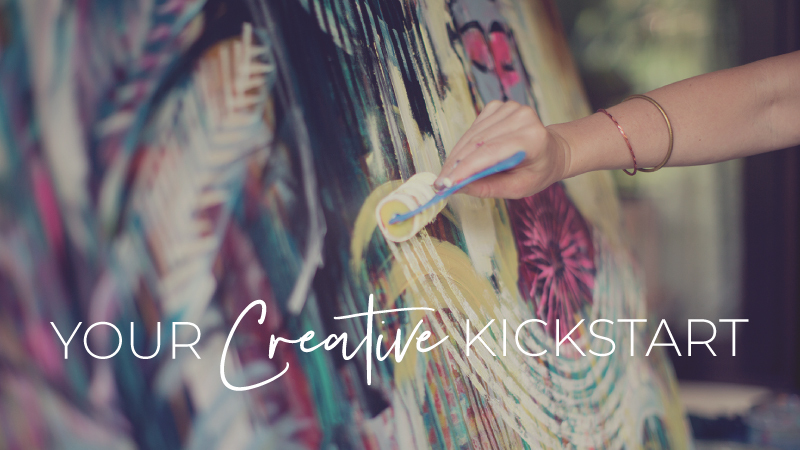 We’ll dive into my favorite practical and intuitive tools to support a soulful, sustainable and successful creative business. For this Diary, we dive into a super hot topic that you’ve been asking for. The burning question is: “How the heck do I finish a brave intuitive painting?” In this Diary, I’ll share some wonderfully tangible principles to keep in mind as you’re working on bringing your paintings together. We’re exploring Making Peace with Your Inner Critic, and this Diary is brimming with loving conversations, soul-searching exercises, personal reflections, supportive resources, and a booty shaking playlist that might just make you forget those pesky voices in your head all together — even for just a song. The theme of this Diary is exploring the Art of Simplicity and we’ll be touching on a wide variety of ways to incorporate simplicity into the layers of your paintings and the layers of your life. The theme of this Diary is all about Exploring Dynamic Contrast, and it’s packed with five Creative Exercises! We’ll explore different ways to work with contrast through the use of color, value, mark, texture, size, speed, mood, medium and scale. Whether it’s subtle or extreme, consciously pushing and pulling elements of contrast in a painting has the power to visually ignite the canvas in all sorts of interesting and powerful ways. The theme of this Diary is Collaboration – one of my favorite topics! Collaborating provides a powerful way to shake things up, welcome new ideas, and practice the art of letting go, trusting and using your voice. There are so many ways to work collaboratively, and I’m happy to share a wide range of resources, creative exercises and couch chats on this topic. The theme of this Diary is Finding Your Style, and it is dedicated to Frida Kahlo, David Bowie, and Iris Apfel. This Diary includes a variety of exercises, conversations and ideas about finding your own style, along with a bit of my own personal journey as an artist. I hope the culmination of this content inspires you to play and explore your way closer to your own unique style. The theme of this Diary is Staying Inspired and it explores the questions of “How do we get inspired to show up in the first place? and “How do we stay inspired when we hit those inevitable creative blocks?” In this Diary, you’ll find some fresh new ways to keep your inspiration flowing. The theme of this Diary is Nourishing and it’s all about tapping into your own flavor of personal nourishment through creative exercises, movement, nourishing food, and resources to reflect on your own relationship to nourishment. Plus, there’s a juicy live painting session! The theme of this Diary is Letting Go and it’s about releasing what no longer works, inviting in new possibilities and staying flexible along the way. We’ll explore the topic of letting go from a few different angles though the videos and resources for this Diary.